RETIRED FROM THE BALL AND CHAIN WAS SCARY. STARTING ANEW IS ALSO SCARY. BUT STAYING THE SAME IS THE SCARIEST. For the past year I have been talking about quitting my job and starting a business. For the past year it has been just that talk. Although I have taken certain steps to familiarize myself with the basics of the business. Reading books, online webinars, Meetup groups and seminars. I’ve done plenty of research and still hesitated to actually pull the trigger. I have been suffering from the results of fear. Fear has a way of paralyzing me and keeping stuck and stagnant. Doing the same thing and expecting different results is the definition of insanity. Well my insanity was alive and well. I continued to be unhappy, going to a job that was making me miserable and unfulfilled. Dreaming of the day when my suffering would come to a end. I remember saying, posting and even blogging several times about being responsible for my own happiness. Sometimes I can give others the nudge they need but not apply my own advice. I am better at helping others and need to realize that I can also help myself. Nothing will change if nothing changes. I have to put in the same effort to help myself. This new business venture is scary. The thought of failing was taking precedence of the fact that I will succeed. The addict in me is prone to negative thoughts and feelings ever second of every minute of every day. If I am not careful those negative thoughts and feelings can and will become my reality. I have the track record to prove it. It has been my story for quite a while and I know that I am better than that. I know that I am capable of doing anything that I put my mind to. I also have a track record that prove that. Once I get over the initial fear, I am a beast. I accomplish the impossible. I still suffer from the effects of low self esteem and doubt. I have to be constantly reminded that I am capable of doing great things. I believe it, but have to be reminded at times. I am still a work in progress and will remember to not be so hard on myself. Critical thinking of oneself whether positively or negatively can have a effect on my outcomes. Living with the disease of addiction isn’t easy. Every day is a new challenge and the results vary. I am grateful that God placed me in this process because I have a hell of a lot more good days than bad ones. I know that if I didn’t make this move now and take the risk to change. A year, month, week or even day from now I would be regretting it. 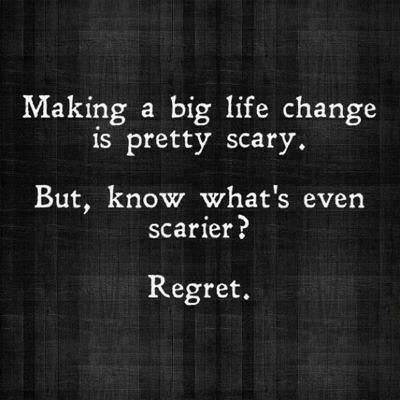 Today I make a lot more changes than I have regrets. ← From Struggle To Strength Store. Thank you brother Drew. Peace and blessings my friend. Have a blessed day.